SISTER SUICIDE is available at Amazon.com. CRIME WAVE PRESS has just re-released the second book in my murder-mystery series featuring a Buddhist monk. 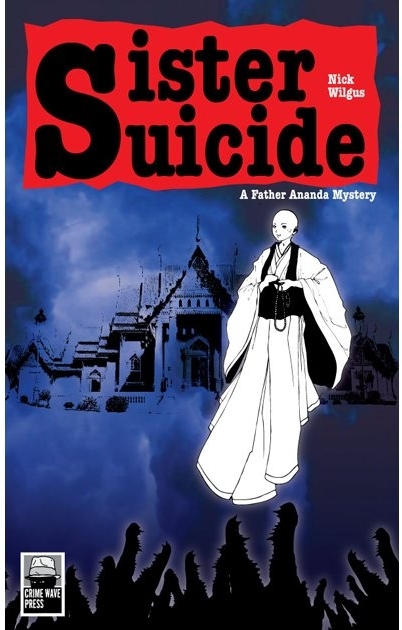 In SISTER SUICIDE, Father Ananda travels to a monastery/temple complex in the Thai countryside to investigate the strange case of a nun who allegedly commits suicide by throwing herself into a crocodile enclosure. Gruesome? Well, yes. The story is based on a report in the Thai press about a woman who committed suicide in this fashion at the Samut Prakarm Crocodile Farm just outside of Bangkok, which I once visited. After I read the story in the newspaper, my mind began to swirl with possibilities. What if the woman had been pushed? Why would someone do such a thing? Was it a spur of the moment crime of passion, or had it been premeditated? I suppose the American equivalent would be pushing someone into the path of an oncoming subway train, which happens from time to time in places like New York City. What sort of person would commit a crime in that fashion? As I considered these possibilities, the outline of SISTER SUICIDE emerged. Another feature of this book is the issue of female ordination, or the lack thereof in Thailand, a rather controversial topic. While any boy or man in Thailand can become ordained as a Buddhist novice or monk and hope for the enlightenment that the Buddha achieved, girls and women do not have this opportunity because it is assumed, by the male Buddhist hierarchy there, that women are incapable of enlightenment. Consequently, there is no point in allowing them to become ordained and take to the Buddhist robes as they are simply wasting their time. They are, however, allowed a sort of second class status as mae chi, or nuns. Catholics have some experience with this. Why are women not allowed to become Catholic priests? Why is the priesthood an exclusively male preserve? The traditional answer is that Jesus chose only males to be his "official" disciples (the Twelve). Consequently, Jesus would not approve of females as priests in his service. Catholics don't go so far as to claim that women cannot be saved, or "enlightened" as the Buddhists say. But still ... women, in the Catholic church, are not good enough to become priests. Their gender disqualifies them out of hand. Never mind the fact that female priests might well be much better at their jobs than male priests. Never mind the spiritual attainments of Catholic women over the centuries. In the patriarchal world of Catholicism, there is no room for women at the top. Thai Buddhists go a step further. Not only is there no room for woman in the top echelons of the ecclesiastical society, women, just by being women, cannot even hope for enlightenment. They are doomed, because of their gender, to take rebirth and future lives of suffering until they are fortunate to take a male body. Only then can they hope to be "saved." Obviously, not everyone in Thailand agrees with this assessment of female spiritual potential. Not even Buddhists, in general, agree with this restrictive thinking. Some Buddhist countries in Asia, like Sri Lanka, allow female ordination. Thai women wishing to become ordained frequently travel to such countries seeking and receiving ordination. When SISTER SUICIDE was originally written, the focus was squarely on the issue of female ordination, and the unfairness of women being denied a rightful place at the spiritual table. My original publisher, based in Thailand, asked me to soften the emphasis and tone, which I did, yet the issue of female ordination is there, between the lines, on many of the pages. Needless to say, I believe women are just as capable as men when it comes to spiritual endeavors. The idea that gender controls your spiritual ability is offensive and nonsensical. SISTER SUICIDE is currently available in ebook format, with the print version to follow in February.